A woman's mind is a very intricate and crazy thing. This post is proof of that in the fact that one small idea... suddenly turned into an entire room makeover. I was cruising Pinterest and saw this adorable floating shelf. Where could I build one? ... Hey it would look good over a washer and dryer. I have a washer and dryer! It needed a shelf! While I immediately began schematics and how to pull this off I realized I'd have to paint the walls before putting this puppy up. So, then I spent three days trying to figure out what to do with this little yet vital space all so that I could build a shelf for it. I tossed around orange and violet and... just wasn't feeling it. But I didn't want to do the WHOLE room in that so I just decided on the entry walls, the one to the garage and the one into the house which left me with two eight foot blank white walls. One has the shelves, washer & dryer and all my new stuff I'm going to build in there. The other... was just blank. 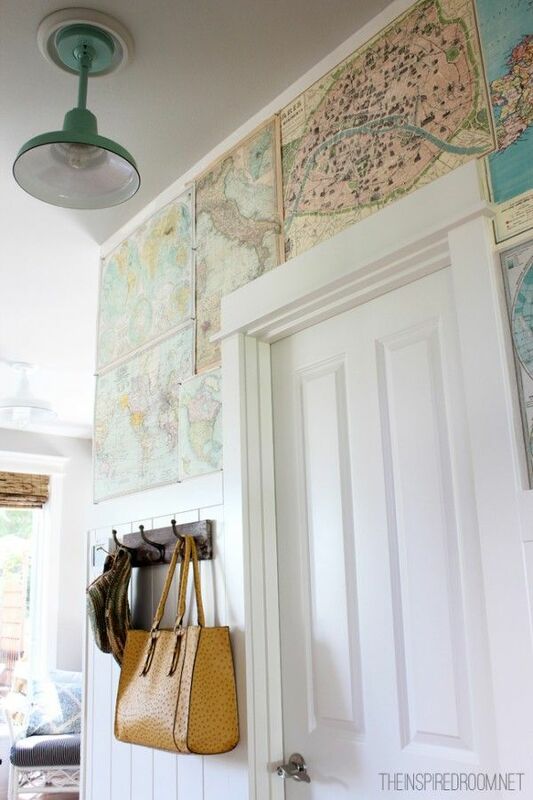 But how I got to that was through this insane process of looking at Pinterest, needing a shelf, having to pick a color, deciding to wallpaper and then needing an accent for an 8 foot wall on the wall I was not wallpapering. If I can make you think you aren't so bad by comparing yourself to my craziness, this blog is not in vain. So, I painted all the walls white with some white paint from a 5 Gallon Bucket I bought during a Home Depot paint sale (Yay... $5 off... wooo...) and that brightened up the room ALOT. Then I decided to use more left over paint from the Boy's playroom making all the paint in this process: FREE. Score. 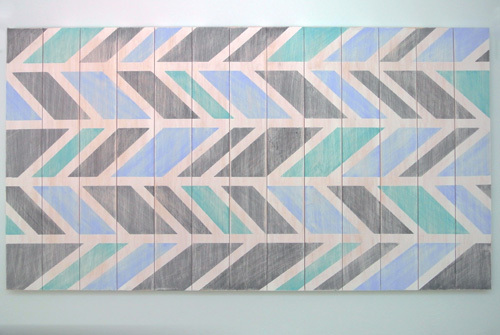 Now the Herringbone pattern is pretty much a spastic Chevron pattern on acid. Come on, we are all thinking it but no one ever says it even though it's true. I knew it would require A LOT of painters tape. 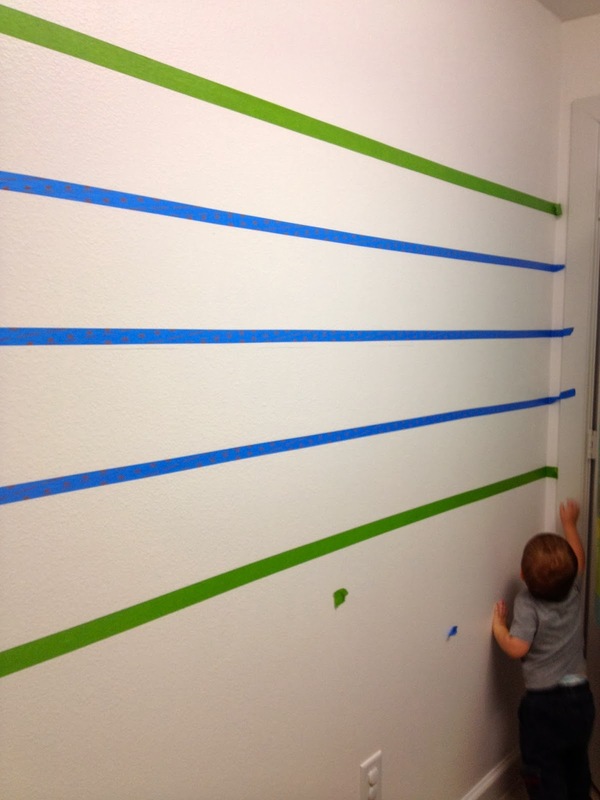 Now, no painters tape is really as good as they say. They leak, they pull paint off... but there are some that are WAY better than others. 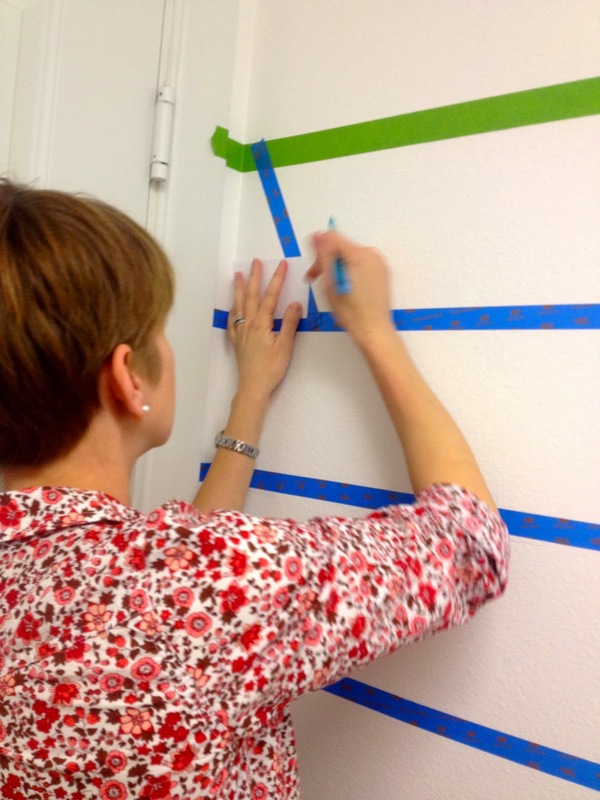 I am a big fan of Frog Tape and when I'm doing stripes it's my go-to. Sadly, Frog Tape doesn't make an under inch strip that I could find easily so I bought this 3M Gridlock tape. 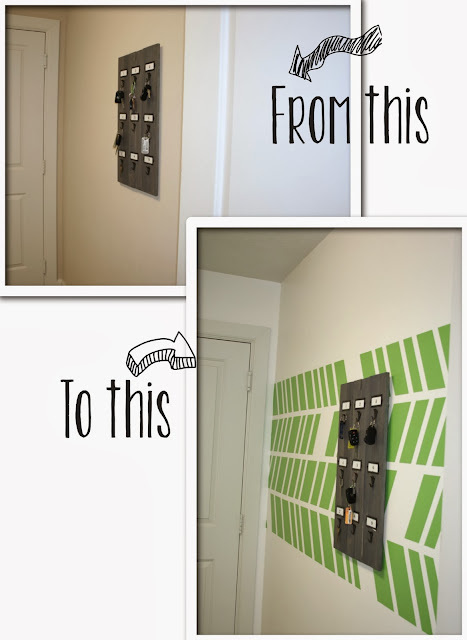 It was easy to use, adorable... not as good as Frog Tape but it did do the job! I first decided how big I wanted the accent stripe to be. 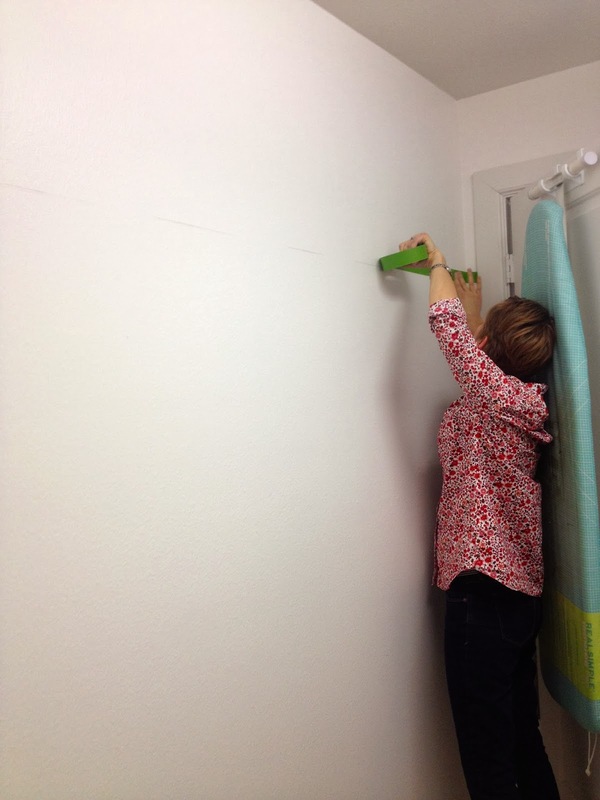 It was going to be the whole length of the wall and then I took a tape measure and just eyeballed how wide I'd want it. I started with the base stripes and put them 8 inches apart making my whole accent strip about 2ft 8inches to give me the four sections. I based it loosely off of this picture because I liked that it wasn't completely uniform so in case I really messed up I could be like, "No! I totally planned for it to look like that." Having my plan in my head (and on paper) I took my level and a pencil and started marking on the wall. This may not be the BEST way to make a straight line but it hasn't failed me yet. I start at one end, draw the line then just keep moving the level down the wall until I have it all the way making sure to keep matching the lines up. We laid down our base lines even though we had little "helpers" trying to remove it. She told me I could use a jig but that if I didn't know what that was (which I didn't) or didn't own one (which I did but again, didn't know what it was) we could make one with an index card. That I did have and knew what it was. We decided on an angle and cut the card at that angle so we could use it as a template for the other tape lines we were going to put on. It was easy and with someone helping you, you can knock it out quick. My friends Sarah and Claire did the first line then left the rest to me. I was able to put up the tape in about an hour and a half. 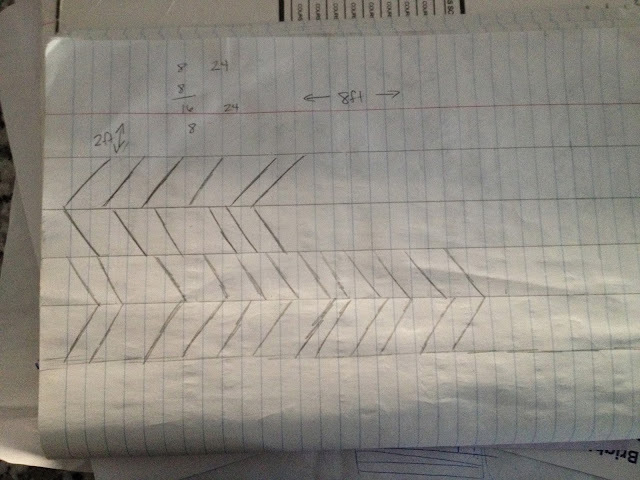 It was time consuming because you had to keep matching the angles. What I didn't do was match up all my stripes. Every once in awhile I'd put it at a different spot just because I didn't want it to be perfect. I liked the more modern Herringbone pattern that makes a bit of craziness look stunning. Now I was ready to start painting! 1. 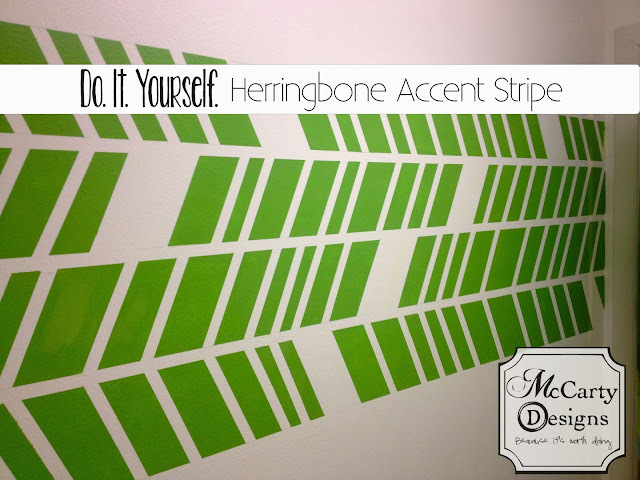 Paint the edges of your tape in your base color. 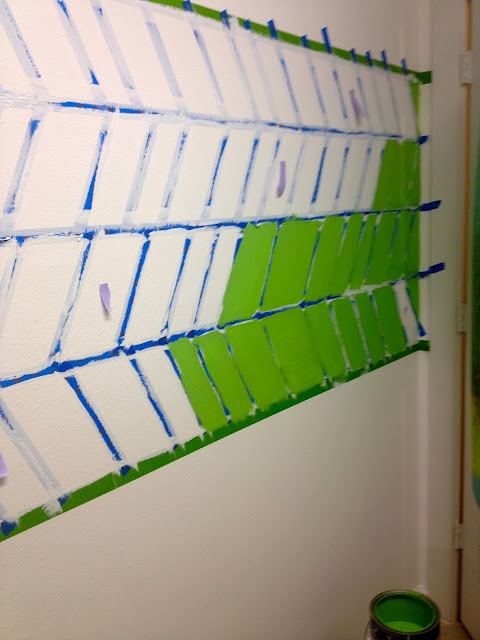 My wall was white, so I painted every edge of my tape with the white paint. ALL TAPE BLEEDS. But if you paint the edges of your tape with your base color, it will bleed the color that is already there rather then the new one you are about to slap on. 2. Once you paint all your edges, paint on your color and don't be stingy. Paint it thick. 3. Remove as fast as you can. Don't let the paint dry on your tape. When you are done, take it off. Don't let it sit there to marinate or something else. If it dries completely it will dry with the tape there so when you pull the tape off... the tape will bring it's dried on paint friend with it. I decided I wanted some white herringbone stripes with my pattern so once I'd finished painting the tape I took strips of ripped post it notes and started to count. I started at one end and counted each slice to 12 and stuck a post it note. I continued doing this all the way around and it ended up perfect. Choose any number you want depending on how many different color stripes you want. Putting the sticky notes helped me to remember not to paint there when I was going to bring in my color. When you remove the tape for this it is going to be tricky since all the tape will stick together. So, if you pull a base line be prepared for all the little shoot off angles to come with it! It's fun and quirky and matches the rest of the boy's wing perfectly. Not to bad for a day's work. Now after I pulled off the tape I did have to do touch ups with a smaller painters brush but nothing compared to if I hadn't used the tape at all. Just don't panic if that happens and you need a few touch ups. You still did an excellent job!! And after you fix it, no one will ever know. And if you like that Vintage Key Rack you can check out a tutorial for it here. I have my own Instagram account now! Now you can follow me on Instagram and see what I am up too before the blog comes out! Also don't forget to subscribe to the right! Just enter your e-mail and you'll make me the happiest person ever. This has been linked up to the Work It Wednesday Linky Party. Hey 2014, how you doin?